I've written before how easy we found it (outside of rush hour) with our bikes on the trains. But it's not just the trains that are set up for bikes / pushchairs / wheelchairs. 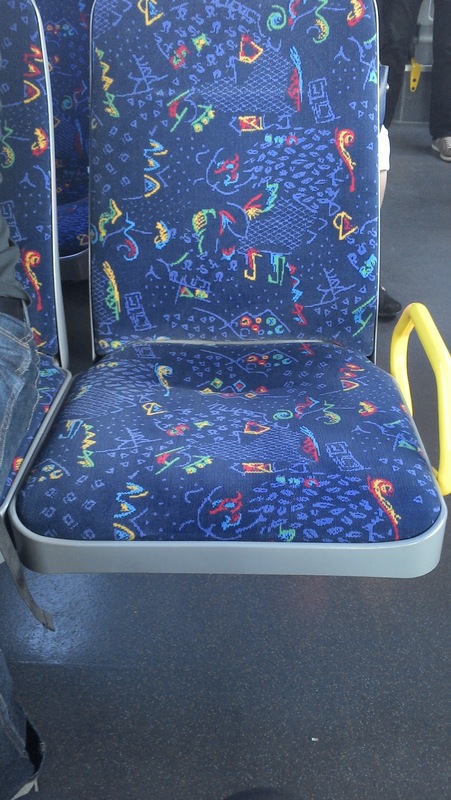 The buses, as they are in many other countries, are very funky these days. 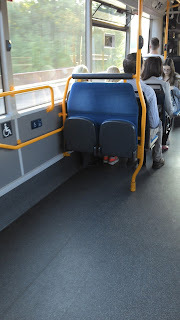 First of all they have the double doors half-way down the bus which open wide enough to allow a passenger to get their bike, pram or wheelchair onto the vehicle. Secondly they have a hydraulic tilting action so that when the bus is at the stop it tilts towards the pavement so the step up to get on the bus isn't high. So far so not rocket science. But what I really like about modern buses are the spaces to put the prams or whatevers. And not just one. With careful management you can get 2 or 3 (or 2 or 3 bikes or a couple of wheelchairs in the space provided. And, oh joy, there are a couple of flip-down seats so that the bike owner, pram pusher or someone accompanying the wheelchair user, can park their backsides for the duration. All in all while I love the routemaster buses, I do like our fancy schmancy new-fangled bendy buses. What I'd like to know is, when did buses get so high tech? they just got rid of the bendy buses in London. They weren't well liked. They've been replacing them with a new type of Routemaster, complete with open platform. I think that makes much more sense in a lot of ways in places like London. On the other hand, how accessible are they to pushchair and wheelchair users? 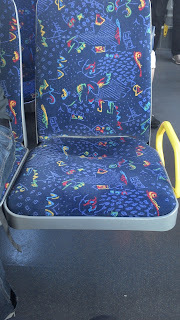 the bus I use is a single decker non-bendy type - it goes every 10 minutes so they get full but not sardine like.